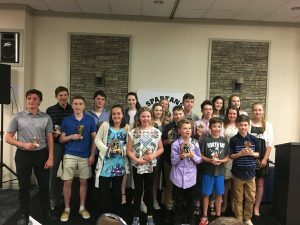 Matteo Pavone & Zach Martel (U19B), Carter Hummel & Hunter Periard (U16B), Adeline Peel & Annabelle Jackson (U11G), Ellie Horning & Brooke Shogren (U17G), Karson Yank & Holden Tuckett(U12B), Cooper Jackson & Sam Jones (U10B), Ethan Sheffield & Michael Travers (U14B), Kianna Dosage & Katherine Herron (U14G), Katelyn DeCook & Mikayla Peel (U16G). Male Spartan of the Year went to John Henry Merkley who lead the U16B to a Bronze medal at the Ontario Cup. Female Spartan of the Year went to Tessa Tignanelli who lead the U17 Girls team.